Silky Zubat 300 is on the the best-selling, professional, heavy-duty hand saw with a 13-inch, curved, mono-constructed blade. Features rust-resistant, hard chrome-plated, taper-ground curved blade with an impulse-hardened non-set tooth design. Curved blade provides greater cutting speed with less effort. Utilizes proprietary Silky MIRAI-ME (Smooth Cutting) Technology - The Teeth of the Future! The precision-ground, razor-sharp teeth with four cutting angles provide fast, clean and extremely smooth cutting action. The hard chrome-plated blade has 6.5 teeth per inch, resists rust and effects of tree resin, and wipes clean easily. 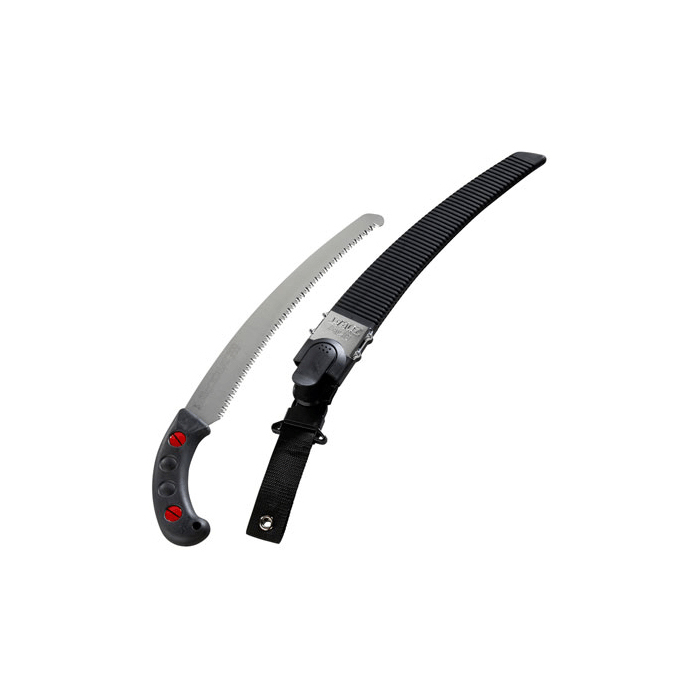 Molded-rubber handle holds the high-performance fast-cutting curved blade that fits securely inside its custom-fitted, pivoting, black polypropylene sheath with detachable belt holder. Great combination of high performance curved blade with a comfortable sure-grip handle that really sticks in your hands. Exceptional design, strength, balance and superior finish quality. Suitable for all pruning tasks and cutting large branches. Made in Japan.